The Brazilian mega-city of Sao Paulo (metro population of 20 million) has completed a significant, 1.6 mile streetscape project in the heart of the financial district’s Paulista Avenue. Guided by principles of Universal Design, the city has documented an increase in pedestrian safety and volume since the construction was completed in July of 2008. Although limited to sidewalk surfaces and pedestrian crossings, URB2 Arquitetos nonetheless consider the whole system of mobility in their design process. he project was undertaken within the context of Sao Paulo’s commitment to policy promoting universal design at the urban scale initiated in 2003. 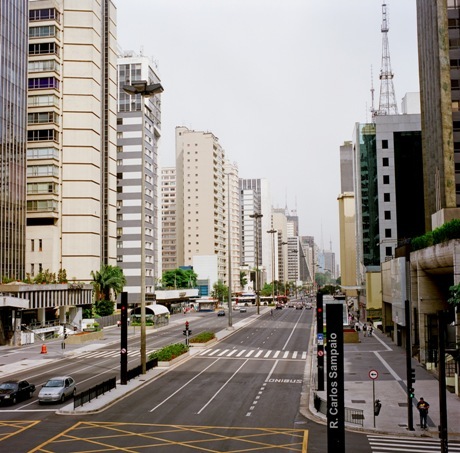 Paulista Avenue is the major thoroughfare through the financial and commercial heart of Sao Paulo. Nearly one million people walk on the (9.00 m (29.5 ft) wide sidewalks every day on their way to financial headquarters, apartment towers, shopping and cultural centers. The street consists of three lanes of vehicular traffic (3.0 m, 9.85 ft each) plus a bus lane (3.5 m, 11.5 ft) in each direction divided by a 2.50 m (8.2 ft) median. As many as 250 buses per hour during rush hour as well as hundreds of motorcycles and automobiles passing along the avenue. A major subway line runs underneath; four stations are located within the limits of the project area. In July 2008, the City of Sao Paulo and URB2 Architects completed the design and reconstruction of 2.6 kilometers (1.6 miles) of sidewalk pavement and streetscape to improve the pedestrian experience. It was designed in accordance with the Brazilian Disability Act and the policies of the City of Sao Paulo, both of which promote the application of Universal Design to all projects. Broken and uneven sidewalks made from mosaic stone were replaced with 10 cm (4 inches) reinforced concrete poured in 4m x 4m (13 ft x 13 ft) square sections with prefabricated rubber joints finished with brass strips. By creating a module of sufficient size, entire sections can be removed for underground work and replaced as a whole. Underground utility access points were rationalized when possible by relocation and consolidation. Removable concrete panels were used for ganged access and incorporate continuous tactile strips. Contrasting colors of concrete and bollards mark corners; precast curb ramps increase consistency and predictability; mid-block and avenue crosswalks set back from intersections separate pedestrians from turning cars, and tactile strips increase legibility of the path. Crosswalks are boldly and clearly striped and curb ramps and tactile strips are organized to provide a continuous path of travel to increase pedestrian safety. Model of streetscape design showing modular concrete sidewalk with contrasting color at corners; tap strips and warning strips at curb cuts; signage; and coordinated utility covers. Image looking toward completed intersection showing new paving, signage, tap strip and crosswalk markings. Avenue crosswalk; signal timing allows pedestrians to cross in one cycle. View showing wide sidewalks on avenue; contrasting pavement colors, fences at the corners to channel pedestrians to avenue crosswalks set back from intersections. Distinctive products used in the project were the precast curb cuts designed by the architectural firm, URB2 architects used on Avenue Paulista as well as other Sao Paulo neighborhoods. Although the project work was limited to the pedestrian environment of Paulista Avenue, the architects approached the design of the project with the understanding that this street, where so many people converge, is part of a larger “mobility system.” The streets and sidewalks of Paulista Avenue are the “connections” to the bus stops and buses, parking and automobiles, stations and subways and each aspect of that system supports every other aspect. If the walking experience is not satisfactory, it will deter people from using it, thereby reducing the robustness of the entire system. These design intentions and guidelines were complemented by some very specific goals for the redesign: to increase the number of pedestrians and reduce dependence on motorized transport; to reduce pedestrian accidents; to introduce concrete pavement as a city standard; and to change the concept of a street from simply a right-of-way to a public space and place of leisure. Perhaps the most potentially controversial aspect of the project was the proposal to abandon mosaic stone paving in favor of poured-in-place concrete divided into 4m x 4m squares. The stone mosaic is considered by some to be a Brazilian signature, however its history in Sao Paulo is not strong. Preliminary work by the City of São Paulo determined that public opinion leaned toward the replacement of the stone mosaic; this formed the basis for the proposal to use concrete. While there is no formal public review process for a project of this sort, various business associations (e.g. Paulista Viva Association) were consulted. The Paulista Avenue Streetscape improvements have brought a new level of comfort and clarity to the walking environment. Removing hazardous and inconvenient surfaces and interruptions in the sidewalks and at the crosswalks and intersections means that people and vehicles move more predictably and safely. There are numerous specific advantages to the users. In addition to providing a much smoother continuous surface, concrete is more forgiving when working with the myriad utility access points that are a necessary part of the public infrastructure. It is possible to make level transitions between pavement and covers. When the sidewalk needs to be broken for a larger project, the modular poured sections provide ample access and can be replaced in their entirety. Small patched areas are much more difficult to match to existing surfaces; this system ensures a level of quality will remain in the paving surface. Contrasting color is used quite successfully to signal to pedestrians that the walking conditions are changing, most often at the corners to signal intersections. The usual signal is a change in the color of the concrete at the corners. With significant pedestrian activity, signaling these changes over a larger area is very effective and especially helpful for people with low vision. With generously sized sidewalks, the corners and crosswalks are also sufficient to handle the large volume of pedestrians. Care and attention is evident in the placement of curb ramps. They are typically placed in line with one another and at one side of the crosswalk allowing those who rely on the curb ramp to cross with other pedestrians instead of having to wait for everyone to cross in order to reach the curb ramp. A recent evaluation by the Municipal Engineering Traffic Company shows an increase of 15% in pedestrian traffic between August 2008 and January 2009. Across the city, including Paulista, there has been an increase in bicyclists, skaters, wheelchair and other users of rolling devices and there has been a noticeable decrease in pedestrian-vehicular accidents along Paulista Avenue. One of the other goals of the project, to develop a standard for sidewalk paving throughout Sao Paulo, has been achieved. After studying the intervention on Paulista Avenue, the São Paulo City Government will use this pavement for the most important urban axes in the city. The urban furniture (bus shelters, public phones) was not under the purview of this contract and the whole street would benefit from better coordination in the location of these elements. But more important is the transformation of an important axis of circulation into an urban public space and place of leisure for the people who live, work and visit the City of São Paulo, Brazil. Name: Gustavo Partezani, Arch ms.